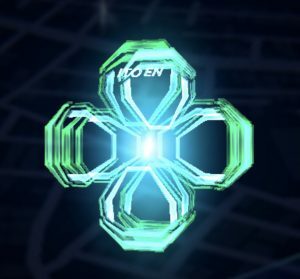 The ITO EN Transmuter is a mod that alters the hack yield of a portal to provide more offensive or defensive items. Portals have an XM “spin” value which can be either -1, 0 or +1. By default, a portal’s spin is 0. A portal with a spin of +1 yields more defensive items (such as resonators and shields) when hacked but no offensive items, while one with a spin of -1 yields more offensive items (such as XMPs and ultra strikes) but not defensive items. Transmuters come in two variants: up (+) and down (-). The up transmuter increases a portal’s XM spin by one when installed, while the down transmuter decreases it. Because a portal’s spin can’t be lower than -1 or higher than +1, installing a transmuter that would push the spin past those limits has no effect. Transmuters of opposite signs cancel each other out. Niantic Labs has indicated that other spin values besides “up” and “down” may be possible in the future. This item is sponsored by the ITO EN tea brand. The transmuter was first revealed near the end of the Agent Olympiad event on 24 June 2017. Ingress version 1.120.2, released about a week and a half later, included the code needed to support the new mod, but it wasn’t actually turned on server-side until 10 July 2017.